OWNERS: Dennis & Rhonda Wagner.Created and built by Dennis with special help and devotion from sons Bob, Ryan & Rick. And daughter April Lee. OVERALL TOPCOAT; 4 coats of Boyds lime pearl suspended in Dupont clearcoat. ENGINE: 2.2 litre, 16 valve, overhead cam. Preformance modified,running on SUNOCO race fuel. Power transfered via 3 speed automatic transmission. 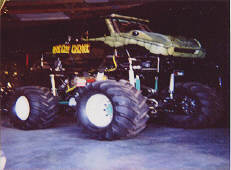 CHASSIS: All tubular construction with 12 point cage. Spicer carrier and Richmond gears. SUSPENSION: Four link, "J" bar, and travel limet straps cushioned by four ride adjustable gas charged shocks. Hydraulic front and rear steer. TIRES: Good Year 31.5tall X 15.0 wide Terra Tires. SIZE: lenght 8'3" height 6'10" width 63"
WEIGHT: unscaled as of yet.